Geek theater has been on the rise. Theater that blends story with themes of the geeky nature in a theatrical world. The latest in the New York trend is Jennifer Haley’s Neighborhood 3: Requisition of Doom at The Flea. Neighborhood 3 turns a video game into life as the lines of reality are blurred. Jennifer Haley’s Neighborhood 3: Requisition of Doom follows a neighborhood of teens who play a new video game called “Neighborhood 3” that transforms their own neighborhood into the world in which they play on screen. The goal of the game is to get to the next level by defeating zombies. But as the teens become obsessed, their parents grow worried as they lose control of their child’s minds. 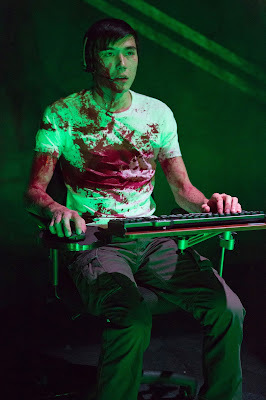 Neighborhood 3: Requisition of Doom is a metaphor-laden, tonally confused piece that is provocative yet executed oddly. Directed by film veteran Joel Schumacher, Neighborhood 3 is part dark comedy and part dark thriller. And depending on the circumstance, the scenes bounced between the two. It’s difficult to say which was the intended style as either could be a viable option but with both presented, Neighborhood 3 doesn’t quite know what story it wanted to tell. And that’s partially to blame with the over-abundance of characters. Haley stuffs her script with fifteen seen characters that are slightly connected. The connective tissue that brings the story together is a teen named Cody, a never seen game host, whose home happens to be a coveted level. With so many characters to track and no arcs for the individuals, Haley’s mission is more about the idea and not about the storytelling. The snippets of character in the two person scenes are a bit of a disservice to the overall piece. What Haley does offer is interesting. The idea of video games imitating life is smart. The idea of gamers becoming obsessed with their hobby and confusing game with reality is fascinating. The idea of winning and succeeding in order to get to the next level is clever. It’s unfortunate that Neighborhood 3 plays closer to an op-ed than an actual play. You could hear Haley’s thesis but it was transparent and didn’t aid in furthering her characters. The twisted comedy is filled with a company of actors who are lost in the confusing levels. Comprised of The Bats, the ensemble did all they could with the game at hand. Virtually divided in half, the young company played either teenager or parent, and strangely, it was the youngsters playing moms and dads that stood out. Sydney Blaxill and Kerry Ipema as Barbara and Joy played mothers of the zombie-playing zombie-like teens and offered a range of strength. Their characters were some of the more dynamic and happen to be the most plot-driven. When it came to the kids, Connor Johnston stood out. Johnston’s Blake was one of only two we watched physically play the game and it offered some of the most interesting moments on stage. As it so happens, Blaxill and Ipema both shared the stage with Johnston. Neighborhood 3 would very likely be a different play had these scenes appeared closer to the start of the play. Joel Schumacher’s direction was unfulfilling to say the least. Jumping from campy to dramatic, his tonal shifts seemed to contradict the text. Regardless, the repetitive staging was uninspiring. But that may be due to the minimal set by Simon Harding. The stage was a ramp with a blend of realistic and cartoonish grass, trees, and street. The intent was clear, blending the real world with the video game world, but Schumacher did not utilize the sections to his advantage. The lighting by Brian Aldous was horror movie-esque. Aldous played with shadows and darkness but with the reflective nature of part of the set detracted from the effect. Luckily the soundscape from Janie Bullard added a nice ambiance during the scenes. It’s ambitious to produce a play like this in the landscape of technology-inspired theater but Neighborhood 3: Requisition of Doom is problematic. Jennifer Haley offers some interesting points but in the end, without a clear and captivating story, Neighborhood 3 was doomed.